Since J.L. 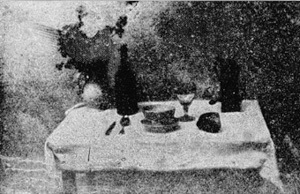 Marignier’s research published in 1999, one knows that the image of the “Table Servie” – whose origins were uncertain – had indeed been taken by Nicéphore Niépce. The researcher’s investigation shows that the image had been a physautotype and was one of Niépce’s last works. In 2004, J.L. Marignier and M. Lourseau tried to find objects similar to the ones used by Niépce, so as to reconstruct the La table tervie. Once the image had been digitized, it was used to determine the dimensions of the different objects and the table itself. Knife, spoon, glass, cup, bowl, bottle, vase, coffee pot of similar size, form and color were collected at various antiques shops and second-hand markets. When the objects were eventually set on the table, the image reappeared in three dimensions. J.L. 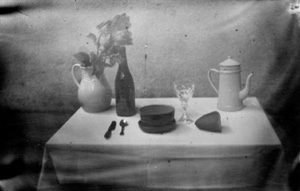 Marignier and M. Lourseau – specialists of the photographic process of the physautotype, which they were the first to rediscover in 1992 – decided to photograph the table with the very same process invented by Niépce and Daguerre in the House at Gras during the summer of 1832. At the end of August 2004, the reconstructed table was set up in Niépce’s garden in front of a camera obscura, into which had been placed a silver plate coated by a white layer of distilled lavender essence. Four hours later, the plate – in contact with the vapors of petroleum – let appear an image highly similar to the one taken by Niépce. The reconstructed La table servie and the physautoype taken are permanently exhibited on the first floor of Niépce’s House. J.L. Marignier’s investigations are published in Niépce, l’invention de la photographie and Niépce, Correspondance et papiers, as well as in articles published in Le Photographe and Réponses Photo in 2004.